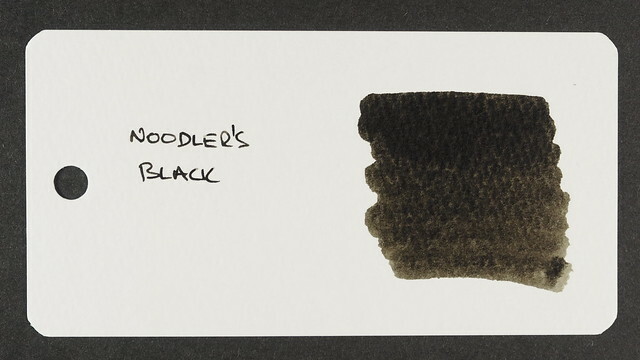 After what seems like an eternity, here is the first in the latest batch of ink reviews, which in this case is for Noodler’s Black. 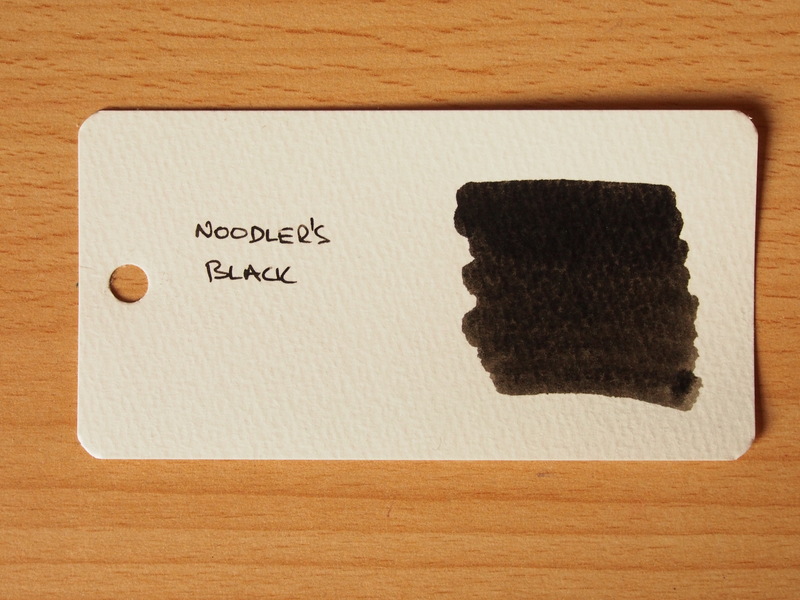 This is a no-nonsense ink – no backstory, no elaborate label – it’s a black ink, plain and simple. The label does state that it is “The only eternal black ink. Bulletproof on cellulose paper, yet washes off plastic with water”. This being the case, should it come as any great surprise that the strength of this ink is ink its functionality rather than its appearance? 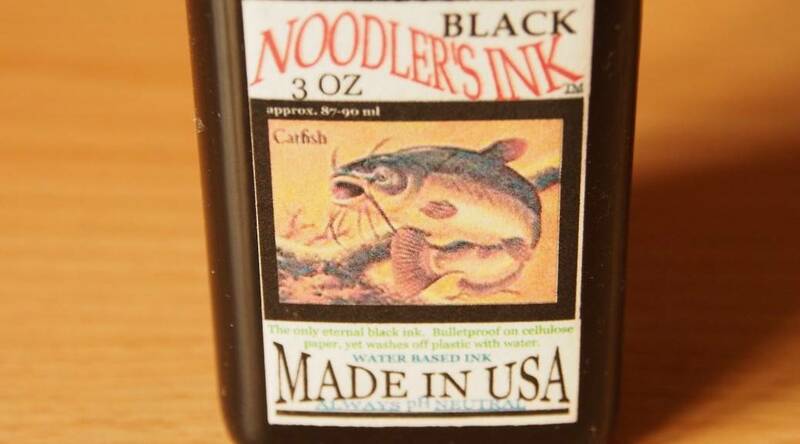 Following this simple theme, the only decoration on the label is the catfish, representing the Noodler’s brand. 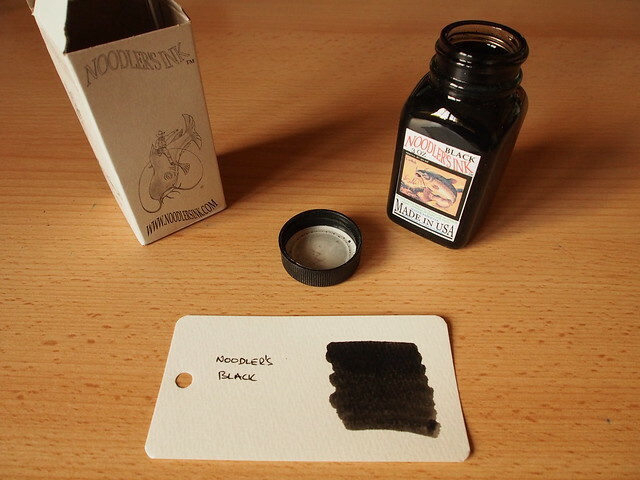 The ink comes in the standard 3oz bottle, and was purchased from my usual Ebay supplier, so fell into the category of moderately priced. 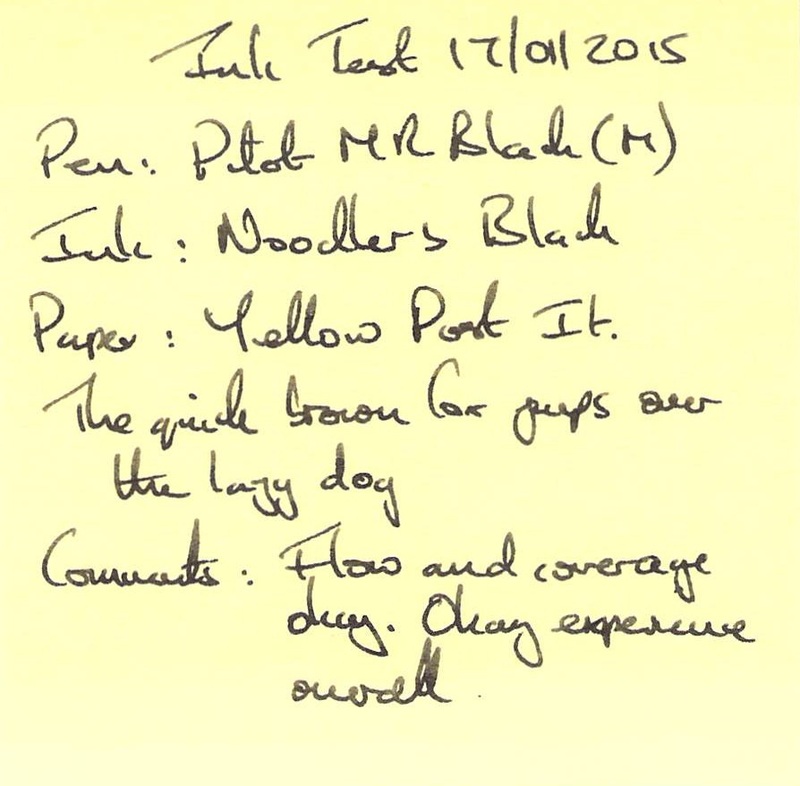 The test pen was a Pilot MR with a medium nib. The pen was originally filled before the Kaweco pen reviews were carried out, and the pen was writing very dry when I came to carry out the review, so I refilled the pen with ink again. Flow was okay after that, but I did note that the ink had started to feel on the dry side after a few days following the original fill. Water resistance was excellent – possibly the best of any ink I have tried so far. Under running water there was no obvious change in the lines. Water drops caused only a small amount of smudging. Cleaning was more difficult than usual, with some heavy sooty deposits, but the pen has been inked up for several weeks. The ink was almost completely dry after 2 minutes, but could have done with longer. The ink laid down a decent, uniform line and flow was okay, but I like my blank inks much more deep than this. Overall the ink looks to me more like different shades of dark grey, not black. Overall okay – not much more to be said – the line is still too weak for my taste. Still okay, but the line is still weak. This is where the surprise came – minimal feathering and bleed through on this very challenging paper. If only the line was a deeper black. This really shows the amount grey shading, which is not really what I want from a black ink. I was dreading writing this review, because when I first received this bottle of ink I was disappointed. 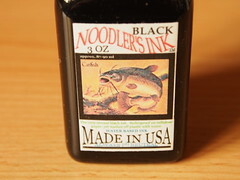 I had heard great things about Noodler’s Black, which appeared to be the “go to” black ink for so many people. 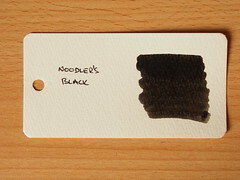 I had already tried a few Noodler’s black inks, and had been pleased with the results. This one would be different. I inked up a Pilot MR and tried trusty cotton bud on a Word Card. 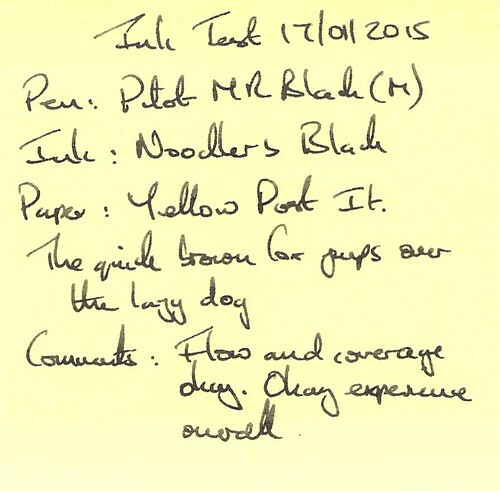 I found the results insipid, and after a few days in the pen I found the ink on the dry side too. Then I tried it in my Pilot Capless Matte Black Pen, which puts down a lot more ink and should have given a darker line. Yes, the flow was better, and stayed so after a few days, but the line was not appreciably darker – it was still too grey for me. 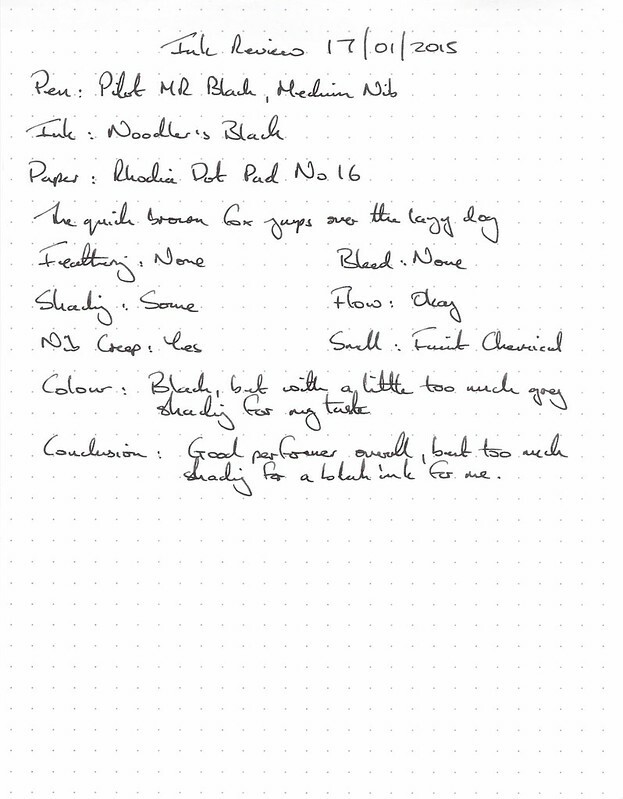 When I decided to base this batch of ink reviews around what could be considered the “staple” inks, i.e. 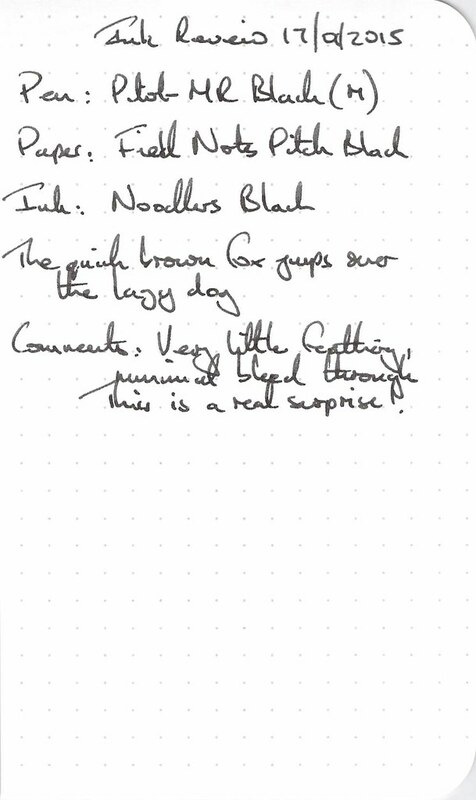 black, blue and blue-black, I knew I would have to reassess and try to be objective about an ink that I disliked when I used it first time around. So here I go. Taking a balanced view this ink is probably as waterproof as you are going to get and is one of the best performers I have seen on Field Notes Paper, which is no mean feat. 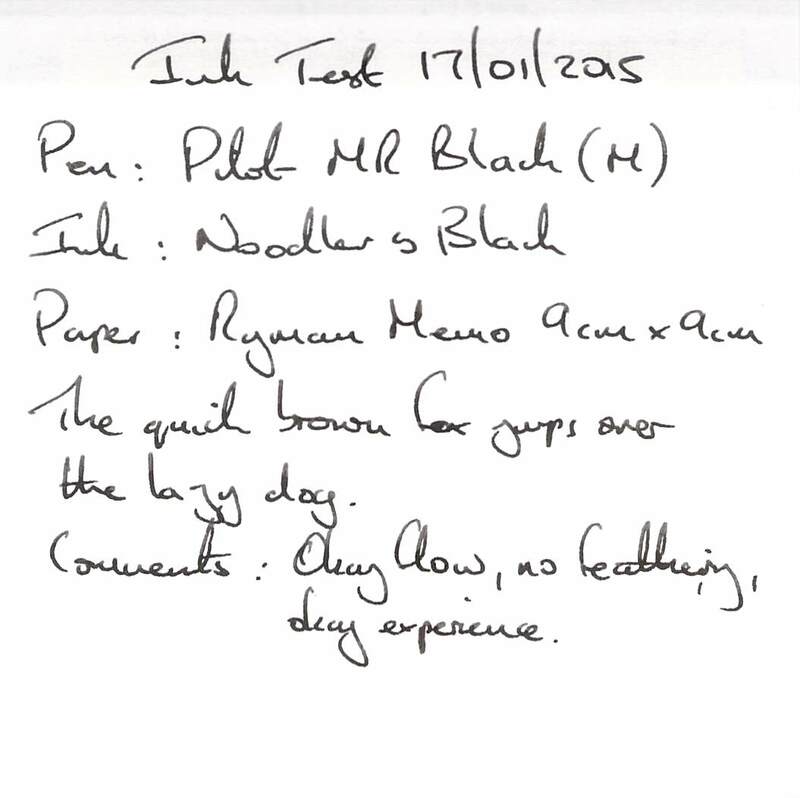 The dry time isn’t great, although many of my favourite inks have very poor drying times. Cleaning was a bit more tricky than usual, but the pen had been inked a long time and I didn’t need to use anything other than water (and patience). 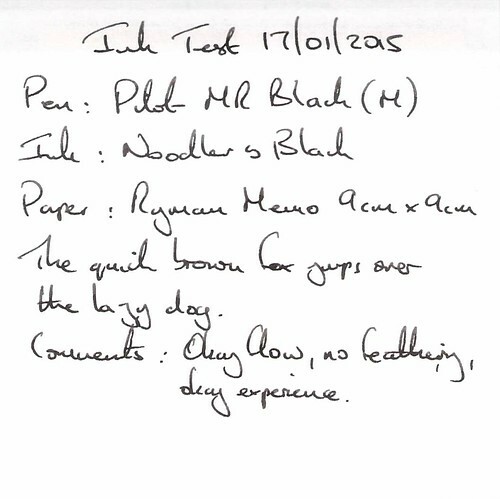 After a few days the ink did start to feel a bit dry, but I didn’t experience hard starts until the pen had been left for a while unused. So for me it really all boils down to lack of depth of the black, which means I won’t be using this ink on a regular basis. This is purely a matter of taste, and others may find it the perfect ink for them.